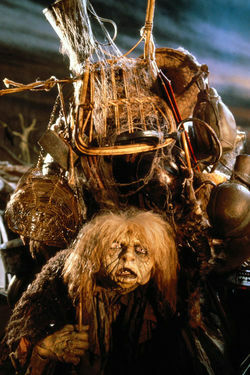 The Junk Lady from Labyrinth–which is sometimes how I think other people perceive me and all my collections. © 1986 Henson Associates, Inc.
I’ve mentioned a few times about our building being sold and our need to move. We had some timing complication because of my husband’s surgery and the medical issue necessitating the surgery, plus the way the housing market has gone insane in Seattle. We were being charged far, far, far under market for a number of years without realizing it. And while we’ve looked at a lot of places, there were issues. Most of them being that the place was too small for us and our stuff. And if the place wasn’t too small it was so far out there that the commute made it as economically unfeasible as staying in our old neighborhood. We found a place last weekend which was big enough, in our price range, and not too far away. It’s in an older building and the neighborhood isn’t as nice as our current one (not that’s it’s horrible, it’s just more suburban mall/strip mall and less home town enclave hiding in a city). We applied, they asked us to come back and put down a deposit, because of the mulitiple applications they’d taken, we were the ones the manager wanted, but he needed to wait for the background checks to complete and the owner to give an okee-dokee. So we’ve been kind of in suspense all week. Yesterday, we signed the lease and got keys. I guess this is happening! I’ll be posting more about the new place, I’m sure. I need to go load some things in the car and get moving, so I’ll keep this brief, at least for me. One of the things that I’m finding myself oddly disturbed about this move is that the new place is not within the boundaries of the City of Seattle. I moved to Seattle 31 and a half years ago to attend university. The first couple of years I lived in dorm rooms at Seattle Pacific on the north side of Queen Anne (which is both a named hill in the city and the name of the neighborhood encompassing it). That put me just two city blocks away from the Ship Canal, which separates the north and south geographic clumps of the city. The next couple of places I lived were duplexes near the same university. Then I moved all the way to the south side of the same hill to sublet a condo near the Opera House. Then Ray and I lived in a small studio in Fremont, exactly one block north of the aforementioned Ship Canal. We moved to a barely larger one-bedroom apartment in the very same building for a few years, before finally moving to the four-plex in Ballard—a whopping 8 blocks north of the Ship Canal. 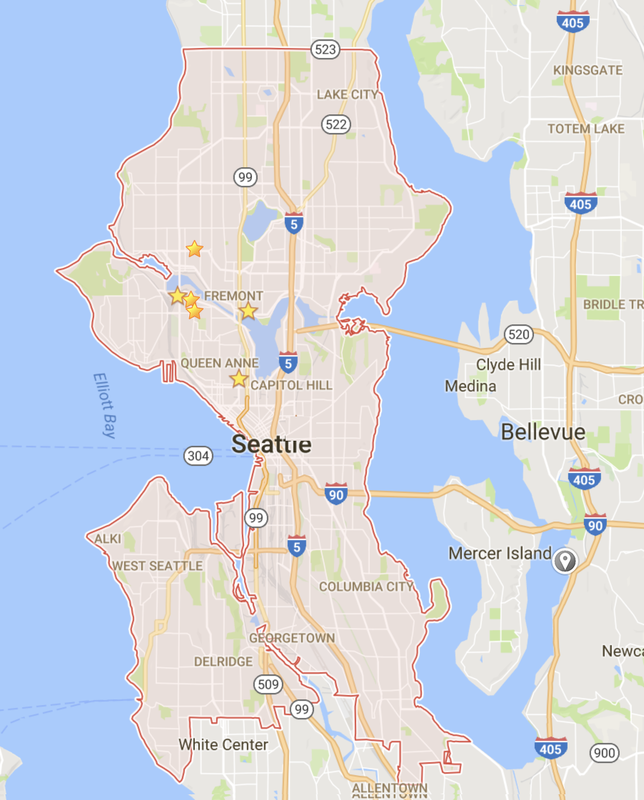 Not only have I been living only in Seattle the last 31+ years, but you can see on the map I slapped-together from a Google maps screen shot and some extra stars, it’s all been in a fairly small part of the city. I’m really familiar with all the stores and restaurants and so forth in this vicinity. I’ve mentioned several times how nice it is that be only two-four city blocks away from two different supermarkets, one of with (Ballard Market Town & Country) I’ve been shopping at for at least 30 years. The blue star is approximately the location of our new place. Now people familiar with the area might point out the the City of Shoreline is barely out of Seattle. The two smoosh up against each other. Most of the border runs along major thoroughfares, so one side of a street is Seattle, the other side Shoreline. And it’s true, Shoreline is practically next door. But we’re barely in Shoreline. 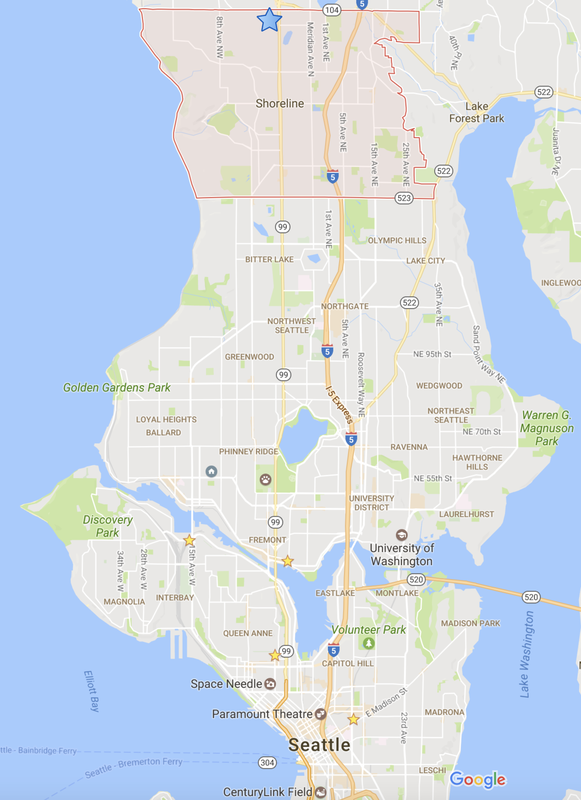 We’re all the way at the far side of it, just five blocks from the border to the next neighboring city, Edmonds. Which coincidentally means were five blocks from the border between King County and Snohomish County. I’m deeply steeped in Seattle politics and was really looking forward to the next round of city council and mayor elections this coming fall. Except by then, while I will still be working in Seattle, I’ll no longer be able to vote there. I have to get used to a whole new set of election tropes! At least I’m still voting for King County Executive and a councilmember (though I’ve been in District 4 forever, and now we’ll be in District 1). Anyway, I’ve spent longer on this than I meant. I have loading to do!